Beloved literary iconoclast Michelle Tea reinvents tarot for a new generation in this guide to using the Tarot as a twenty-first-century tool for connecting with our higher selves. Long before Michelle Tea was winning awards for her poignant memoirs, she was a scrappy misfit on the streets of San Francisco, supporting herself by giving eerily prescient tarot readings. As her reputation as a writer grew, she stopped publicly reading the Tarot, though she never stopped doing it privately. 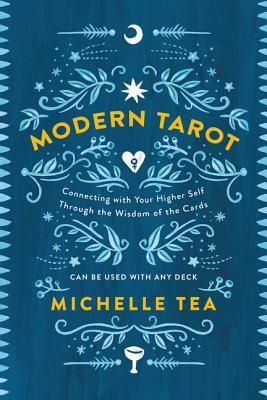 Based on over twenty-five years of experience and a deep and abiding love of the cards, Modern Tarot brings the full force of Tea’s unique insight, inviting pop sensibility, and wicked humor to bear on the tradition of the Tarot in a fascinating journey through the cards that teaches us how to use this tradition for radical self-growth. Whether you’re a dyed-in-the-wool seeker or a digital-age skeptic—or a little of both—the power of tarot is open to you. Modern Tarot doesn’t require you to believe in the supernatural or to focus narrowly on using the tarot as a divination tool. Instead, it offers fiercely insightful descriptions of each of the seventy-eight cards in the tarot system (each one fully illustrated by Amanda Verwey) and specially designed rituals to guide readers on a path toward transformative personal growth. Grounded in Tea’s decades of tarot wisdom and personal experience, this is a guide that beginners will fall in love with and experienced readers will learn from anew. With her trademark one-of-a-kind insight and wit, Tea shows how tarot offers moments of deep, authentic connection during a time when “connection” is ubiquitous but rarely delves beneath the surface—and how the affirming and personal nature of the Tarot offers a spiritual experience that is gentle, individual, and aspirational. Michelle Tea is the author of ten books of memoir, fiction, and poetry, including the award-winning Valencia (now a film) and the speculative memoir Black Wave. She is the editor of the Sister Spit imprint of City Lights Publishers and of the Amethyst Editions imprint of The Feminist Press. She lives in Los Angeles, CA.